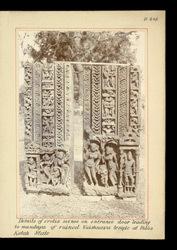 Photograph of the carved entrance door of an ancient Vaishnava temple from Bilas in Rajasthan, taken by an unknown photographer for the Archaeological Survey of India Collections: Northern Circle (North-Western Provinces and Oudh) in 1896-97. Bilas is a site hidden in the dense jungle, about 65 miles east of Kotah. The archaeological remains consist of ruined dwelling-houses, palaces and temples that are Shaiva, Vaishnava or Jain and are of an ancient city formerly called Suvarna-panari-pura. The most recent inscription discovered at the site dates to the 14th century and refers to an earthquake that most likely brought about the demise of the city. The doorway in this photograph once led to the Mahamandapa, what would have been the main assembly hall of the Vaishnava temple. The remains are carved with figures involved in sexual activity, rearing mythical beasts and scrollwork.